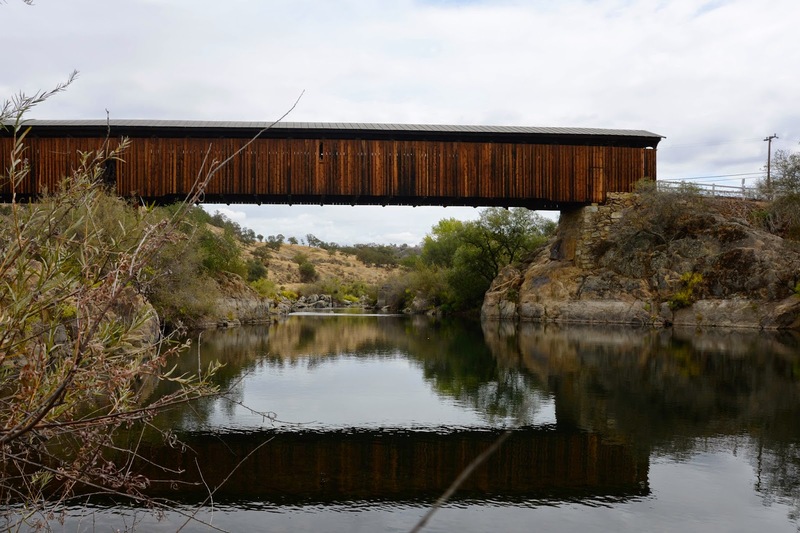 The Knight's Ferry Bridge was built in 1863-64 to replace an 1857 uncovered wooden truss that was destroyed in a flood. This was an important crossing on the heavily traveled Stockton-Sonora Road during the California Gold Rush. The Knight's Ferry Bridge is the longest covered bridge west of the Mississippi River. This bridge is a 330 ft long Howe truss. It was posted to the National Register of Historic Places in 2012. There is a museum and many of the original buildings are still standing around this bridge. Unfortunately the bridge is a little worn out and signs prohibit the gathering of crowds onto the bridge. It was closed in 1981 and rehabilitated in 1989. Stanislaus County, California Bridges: Knight's Ferry Bridge across the Stanislaus River (1) by Mark Yashinsky is licensed under a Creative Commons Attribution-NonCommercial-NoDerivatives 4.0 International License.